A dramatic, heart feeling, and soul searching record. A favorite of the artist himself. The eight time CMA winner and legendary Danny Davis of the Nashville Brass made his final appearance on this CD. He played... "Danny Play" and then past away. 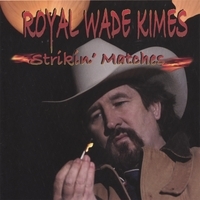 Strikin' Matches is now the leading Royal Wade Kimes CD in physical sales as well as downloads! The single Danny Play has been a standout on the record, which means it is brilliantly done, because all the tracks on this CD are stellar. AWSOME - AWSOME !! I alway buy all of Royal Wade Kimes' albums, but this one is my personal favorite. The song "I Come To Dance" is the best ever!! "Jacob's Well" and "The Stranger and Clyde" are close behind. For a real taste of Western music from the heart - this is the album!! My husband has been raving about Danny Blow Your Trumpet since he heard it on the XM. The CD is wonderful. This is with a doubt one of this best ablums I've had the pleasure of hearing in many a year. The songs have lyrics that actually tell a story and Kimes voice is strong and carries over the instruments nicely. Great arrangements. But the kicker to this ablum is the song "I've Got Your Back" one of the best songs I heard from the country music writers in years. Every Royal Wade Kimes CD is fantastic, and this might be his best. His voice is unique and truly country. You've got to hear this man sing. If there were any justice in the country music business, he'd be a star. One of the best country/Western singers there is. Looking to the east, looking to the west - Royal is the BEST, thank you Royal for this fantastic CD, keep up the good work. Superb. I will be buying all this guy's Cd's. Great sound. I like the way Royal Wade Kimes has brought Western back into Country and Western. A really fine selection of songs on each CD. I bought 3 of his CD's in one go, and guess what? Every track on every disc is superb. Really glad I bought them. Thanks to CD Baby. With out a doubt the best CD I have! I have all his productions - awesome - I need and antidote - can't stop.